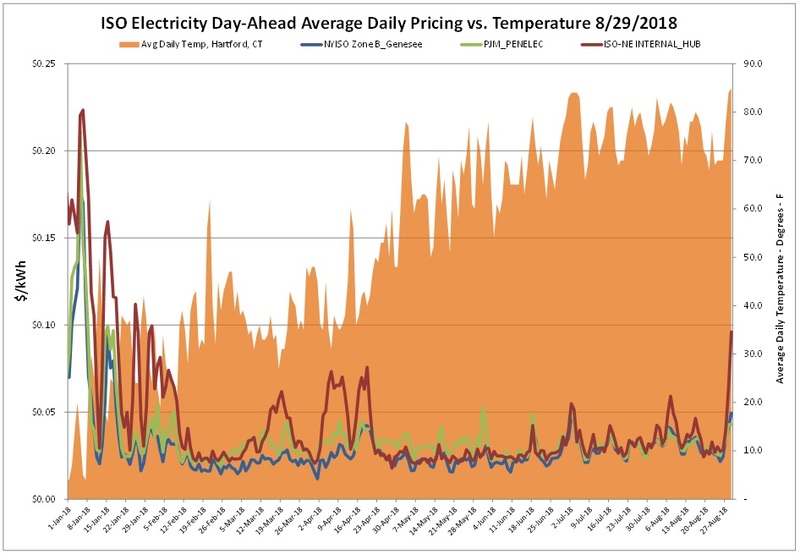 Electric markets were relatively stable, despite scorching hot temperatures across much of the country that attributed to peaking demand in many of the country’s ISOs. 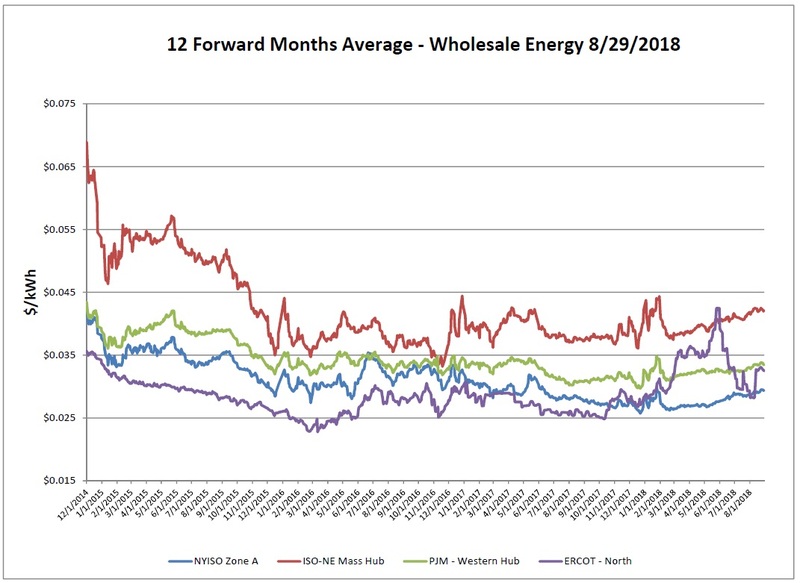 Both NYISO (hour ending 5 p.m.) and ISO-NE (hour ending 6 p.m.) hit their peak demand levels on Tuesday 8/28 and then again were reset on Wednesday 8/29. Along with the peak demand reported, the day-ahead market went screaming up at the end of the report week with temperatures scorching the Northeast. Most severe was ISO-NE which saw quite the drastic run-up in prices. 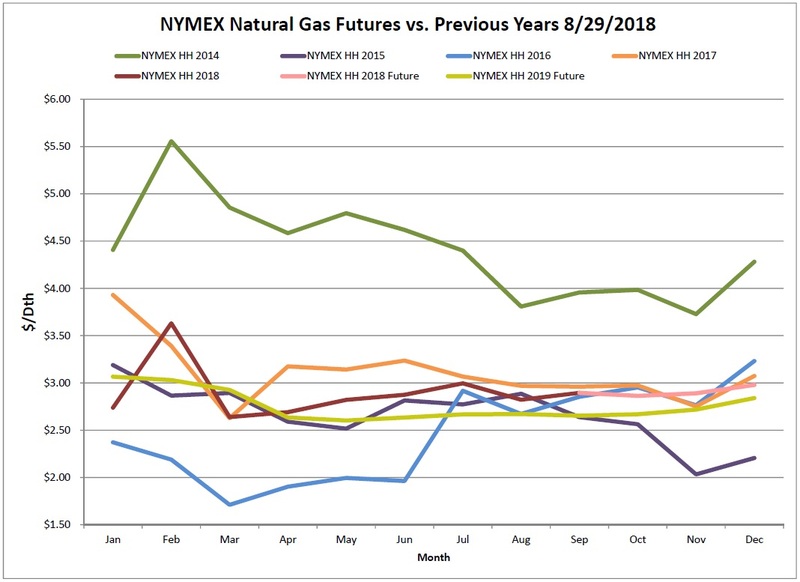 On Wednesday, August 29th, the September 2018 NYMEX natural gas futures price settled at $2.895/MMBtu. The 12-month NYMEX strip as down 10 cents over the report week, while the Algonquin basis also dropped an additional 4 cents. Natural gas production continues to set records and has held above 82 Bcf since August 16th. 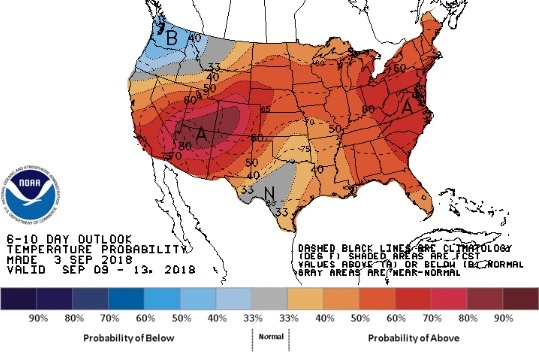 The upcoming winter posted even greater losses, as it appears there is confidence that the supply and demand will break once the current heat dissipates. As of Friday, August 24, 2018, working gas in storage was 2,505 Bcf. According to EIA estimates this represents a net increase of 70 Bcf from the previous week. An all-time production high hit over the report week. The growth rate appears to have outpaced many expectations. Natural gas demand has also been high in July and August. 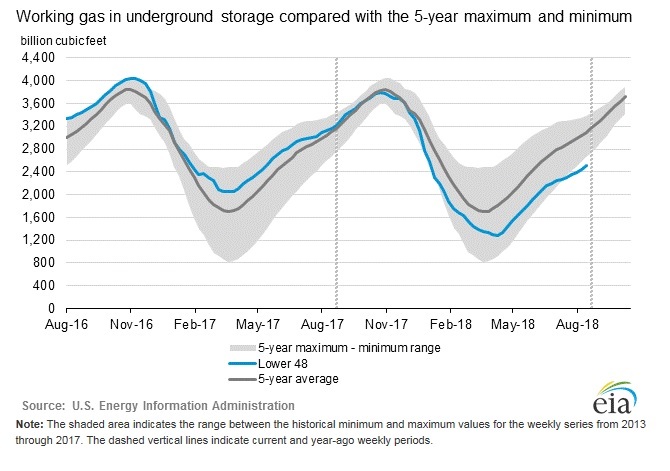 This has continued to contribute to the low storage levels and deficits to the 5-year average. 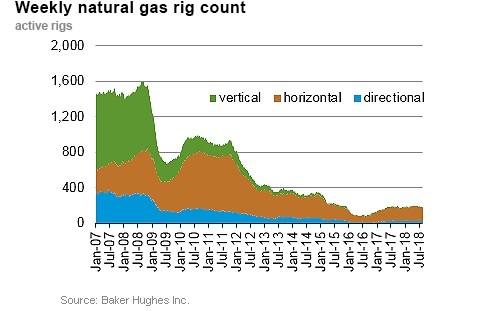 The Baker Hughes exploration gas rig count increased 2 from the previous week for a total of 184 rigs. The report total is 1 rig more than were in operation last year when there were 183 rigs. Forecasts are showing very summer-like conditions to continue for at least another week. Hot and humid weather forecasts along the east coast and mid-Atlantic show temperatures in the low-90’s. This should keep demand high and the potential for peak days alive. Click here to view the National Hurricane Center site. Click here to view La Nina and El Nino status. FirstEnergy Solutions Corp. (FES) on Wednesday notified PJM Interconnection of its intention to shut down four fossil fuel plants in Pennsylvania and Ohio in 2021 and 2022, including 4 GW of coal capacity. Rhode Island regulators on Friday signed off on a settlement allowing National Grid to raise residential rates by 3.5% while investing in a range of modernization and grid transformation initiatives to enable more clean energy benefits. If you would like to receive the Energy Market Update to your inbox weekly, please click here to submit your name and email address.